HDR brachytherapy boost is utilized for dose escalation in the treatment of clinically localized intermediate to high risk prostate cancer, but long term clinical outcome data continues to mature. This report examines long term clinical outcome in a large cohort of patients treated in a single institution, extending an initial 7 year follow-up (Zwahlen, 2010) to a median follow-up of 11.9 years. We reviewed data of the men treated for clinically localized prostate cancer with curative intent between 1998 to 2004 at our institution. A total of 655 patients received either 3-dimensional conformal radiotherapy (median 46Gy) in combination with a HDR (median 18Gy in 3 fractions) boost (‘3DCRT+HDR’; 215 patients) or 3DCRT alone (‘3DCRT’; median 70Gy; 440 patients). Men with National Comprehensive Cancer Network (NCCN) intermediate risk disease were offered neoadjuvant androgen deprivation (AD) and those in the high risk category were also offered adjuvant AD. Data collection included serial questionnaire based assessment of acute and long term adverse effects. The median age was 68.9yrs and 70.8yrs for the 3DCRT+HDR and 3DCRT groups, respectively, and the median presenting PSA (iPSA) was 12.2ng/mL and 9.9ng/mL, respectively. 15.3% of the 3DCRT+HDR group had a Gleason score >7, with 29.3% presenting with clinical category > cT2. This compared to 12.5% of the 3DCRT group who had a Gleason score > 7, with 25.7% of that group presenting with > cT2 category. The 3DCRT+HDR group had an expected lower proportion of NCCN low risk patients (4.3% vs 20.9%) and higher proportion of NCCN high risk patients (50.7% versus 37.5%) compared to the 3DCRT group. 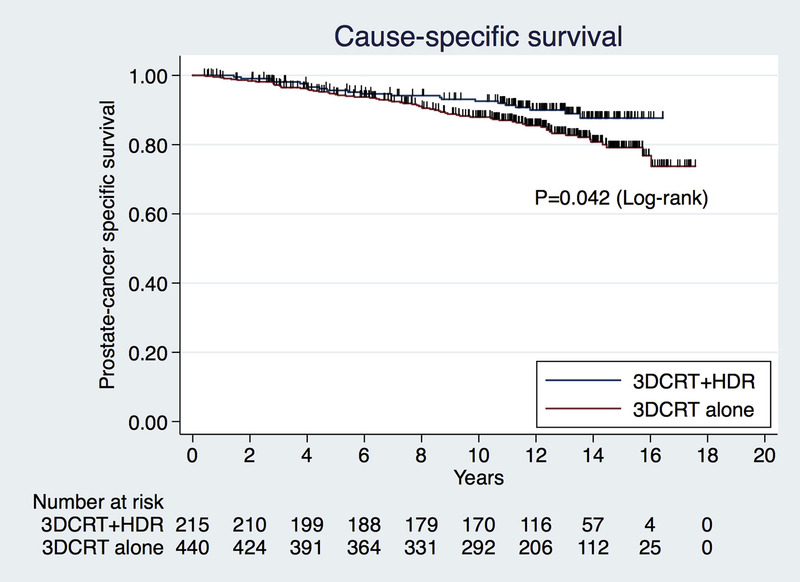 The 5 and 10 year overall survival was superior at 90.7% and 80.3%, respectively for the 3DCRT+HDR group, compared to 87.2% and 69.9%, respectively in the 3DCRT group (p<0.001). The 5 and 10 year cause specific survival also favoured the HDR boost group with survival of 95.7% and 92.5% (3DCRT+HDR) and 94.5% and 87.9% (3DCRT), respectively (p<0.042). 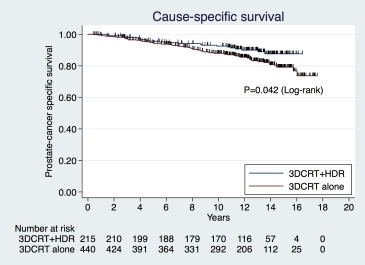 HDR brachytherapy boost in conjunction with 3DCRT offered superior overall survival and cause specific survival in our large patient population, with extended follow-up identifying late divergence of the survival curves suggestive of a persisting benefit.